Ralph Thorn Pianos offers quality rebuilt pianos on a limited basis. Pianos for sale are completely rebuilt and usually refinished, and are very unique instruments. Since Ralph specializes in historic instruments the pianos tend to be early, ranging from the early 1800’s through to 1920. 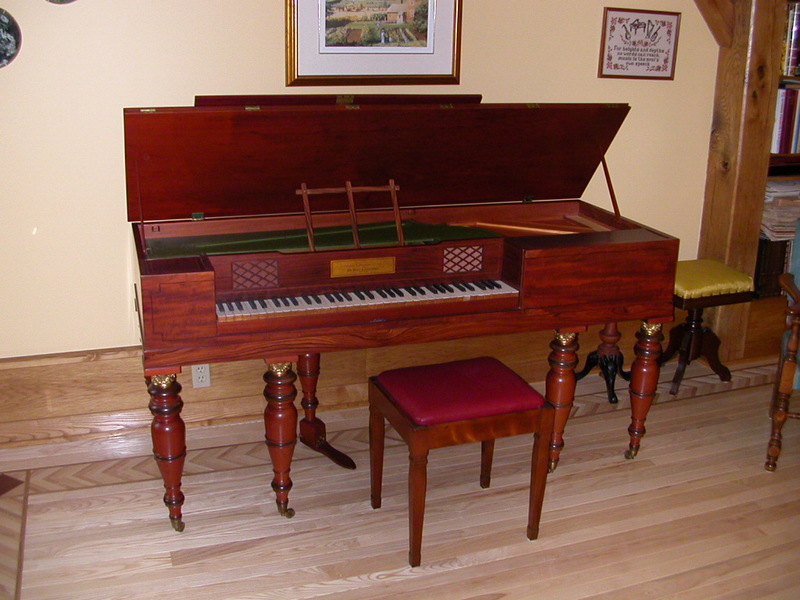 Square pianos originated in Germany in the mid-1700’s, evolving from the clavichord. They were less expensive to build and easier to move than the other popular piano style derived from the harpsichord. Very popular in homes due to their small size and sound, the squares were the work-horse piano and outsold the “grand piano” nine to one. In Europe they retained their small physical size, but in North America the instrument gradually grew in physical size and range. 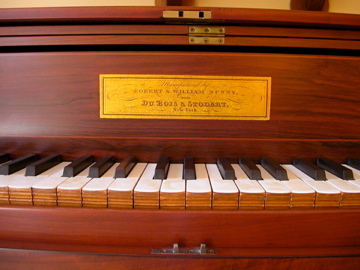 Square pianos were built between 1740 and 1890 when the manufacture of all squares ended, supplanted by the upright. 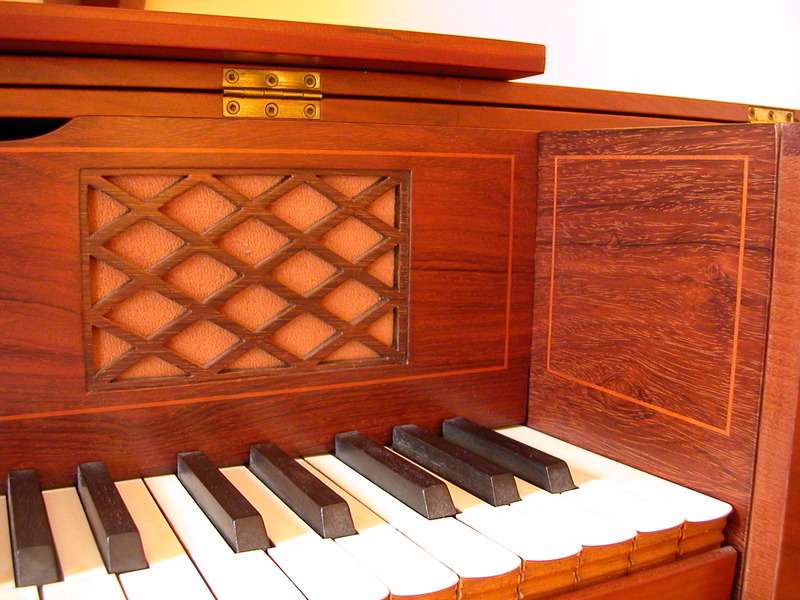 Squares have a unique sound and mechanism and are eminently suitable for recreating the music of the 1800’s, especially popular music. Due to inherent structural deficiencies, square pianos were difficult to maintain, so very few are now found in good playing condition. The Nunns family emigrated from London, England in 1821 and established a piano factory at 96 Broadway in New York City. Soon the firm was a principal builder of pianos in the city, later becoming known as Nunns and Clark. It was here that the young William Steinway received his introduction to American piano building and who in 1853 became one of the founders of the Steinway Piano Company. In fact, the Steinway family bought the workshops of Nunns and Clark, thus this piano was built in the same location as the early Steinways of NYC. 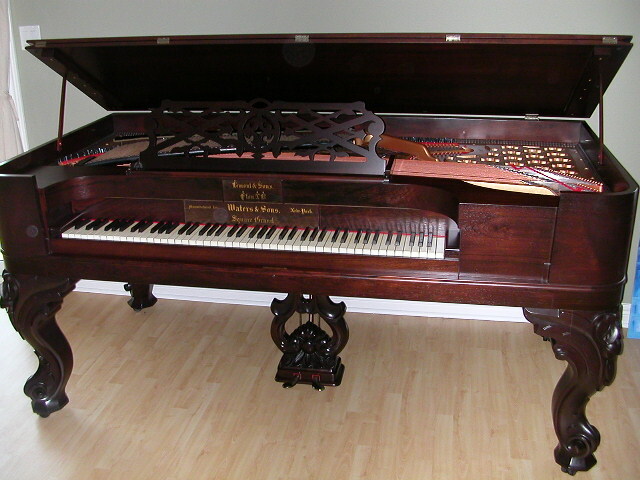 This piano has no metal framing since this feature was only added in squares built after 1840 which allowed for greater stability and increased string tension. Mahogany and rosewood with pear wood inlays, solid mahogany turned legs, single pedal, completely rebuilt with new soundboard. For a fact sheet on this instrument, click here. This instrument is being rebuilt at this time. Follow the process of rebuilding as photos are posted to its own website. To view this piano’s respective website, click here. A full-sized square finished in rosewood with cabriole legs. Fully rebuilt with historically-suitable wire and hammers. A splendid instrument to replicate the experience of music making in the late 19th century. Piano differs slightly from one shown. This instrument is being rebuilt at this time. Soon a website featuring the process will be launched.